Winning Room Casino will then reward you with a bonus (Welcome Bonus is for new players only). The terms and conditions of the bonuses vary between different casinos and might also change over time and between different countries, so it is important to compare the different offers and read the T&C for Winning Room Casino before signing up. As a part of Evoke Gaming, Winning Room casino holds an MGA, UK Gambling Commission and Government of Gibraltar gambling licenses and offers hundreds of RNG certified games, reviewed and tested by independent agencies. The vast gaming selection is not the only reason WinningRoom has earned an exceptional user satisfaction score – for the first-time depositors and newly registered members, the casino has prepared a generous welcome offer that covers three deposits and amounts to £1,000 bonus money. WinningRoom sorts the games in four groups – depending on what you are looking for, you can browse the games according to functions (Auto, Quickspin, Bonus modes, Free Spins and Wilds), number of paylines, slot volatility and the suppliers (NetEnt, Play N GO, Quickspin, Microgaming), and play all of them for real money or for fun. The games are further divided into Jackpot, Table Games and Poker and can be sorted according to the popularity, name or date of release. An additional category is added for those who are hooked on winter magic, featuring holiday season themed slots such as Snowflakes, Great White Elk, The Lost Princess Anastasia, Chinese New Year and other similar releases. Slots can also be filtered according to the name, the level of popularity, date of release and personal favourites. If you would like to double the action, you can do that by adding an additional game from the gaming menu and play on two screens simultaneously. Progressive slots are placed under a separate category and they are also available in test play mode. The information about the current jackpots is displayed on the badge at the game thumbnail picture and classics such as Mega Moolah, Mega Moolah Isis, Mega Fortune, Cosmic Fortune, Hall of Gods and others can found here. Regardless of your preferences, you will easily find a suitable game under this category, as it offers different variants of Roulette, Blackjack and Baccarat. Each of the games can be bookmarked as a player’s favourite and played at the same time with any of the other releases from WinningRoom casino offer. Unlike with most of online casinos, WinningRoom does not have Other Games category, although there is a section with Winter themed games, mention above. Most of the Live Tables are powered by NetEnt and the casino lets you list and select the games from the drop box menu by choosing one of the following categories – Blackjack, Roulette, Baccarat and Poker. The table limits for most of the tables are clearly visible before you even launch the game and all you need in order to play is an active casino account, which can be opened in just a few simple steps. WinningRoom casino accepts Visa, Visa Electron, MasterCard, Neteller, Trustly, Paysafecard and Zimpler. Maximum amounts that one can deposit or withdraw will depend on the selected payment method – Neteller users will be able to transfer €10,000 over to the casino without paying any fees and with just 1 to 2 minutes waiting times. The same waiting time and 0.0% fees apply to Skrill and Paysafecard payment methods, while direct bank e payments (with some exceptions, such as Finland, Nordea, Danske bank etc) come with no limits and 5 minutes processing/waiting time. For larger withdrawals up to €1,000,000 players should use e bank payments or Neteller and Skrill for up to €10,000 amounts. Payment card users can pull out a maximum of €3,000 with 2.5% fee and instant processing time. 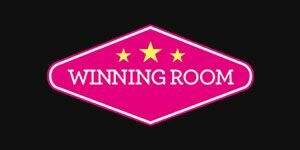 If there is anything that you need to discuss or confirm with the casino’s representatives, WinningRoom offers Live Chat option as well as email and phone support. The support is available in multiple languages and users can reach out in Portuguese, English, Suomi, Spanish, Svenska and Norsk. The support is not available around the clock, but the response time is negligible and agents are fast and efficient. 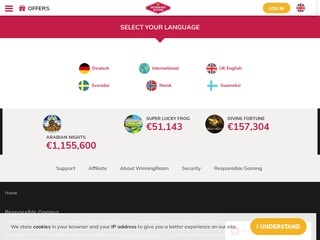 In case you are in need of an immediate assistance, WinningRoom also offers a detailed FAQ section, where you are likely to find an answer to your question without having to “hassle” the casino representatives.